This fitter mount is perfect for replacing old gas and electric lamps. After securing all old gas lines or wires, just put our lamp on top and flip the on switch. GAMA SONIC is the world leader in solar lighting products for homes and businesses with over thousands of products installed worldwide. Founded in 1985 as a manufacturing and marketing company of emergency lights and other electronic products, our products incorporate plastics, stainless steel, cast aluminum, electronics and OEM services in various markets. 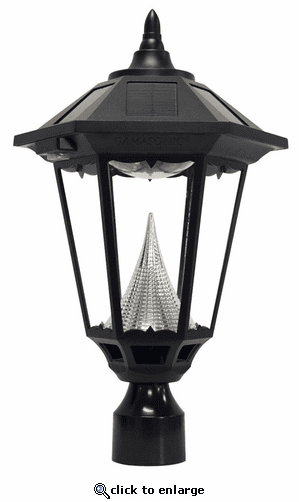 Since 2001, GAMA SONIC has introduced innovative and cost-effective outdoor solar powered lighting products that provide unsurpassed levels of illumination and reliability using our patented technology. We have developed more than 100 innovative solar lighting products. GAMA SONIC develops, manufactures and markets consumer and commercial/industrial-grade solar powered, energy efficient, custom lighting solutions for a wide range of lighting applications. GAMA SONIC is committed to superior design, manufacturing, and customer satisfaction. For the past 30 years, Gama Sonic has been the leader in developing and manufacturing emergency and rechargeable products. In 2001 Gama Sonic engineers began developing and manufacturing solar powered lamps and accent lighting, changing the poor perception of solar technology forever. Using only the very best components and our patented cone reflector technology, we are able to make solar lights shine brighter and last longer than the competition. We have also done this without sacrificing the quality and appearance consumers have become accustom to seeing and enjoying. As we move into the future, Gama Sonic has a laser focused approach researching, evaluating and developing new solar technology, always staying one step ahead of the competition. Gama Sonic also takes pride in our ability to contribute green alternatives for outdoor lighting, helping to reduce our carbon footprint.